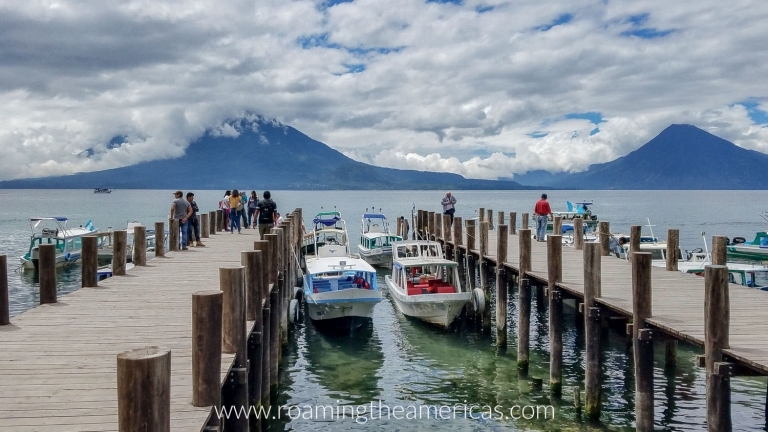 Do a search for the top things to do in Guatemala, and you’ll likely find a lot of the same: Tikal, Antigua, Lake Atitlan, and Semuc Champey. And while those are all worthwhile experiences (I love me some Antigua), as a new friend I met a few weeks ago told me: the whole country is an experience. Whether on the tourist trail or not, each community has a unique story and there are fascinating things to find throughout the country. I recently traveled back to Guatemala (my 6th time around!) on a trip coordinated by Travolution, which is an organization that promotes sustainable development through community-based tourism initiatives. What exactly is community-based tourism? Often when we travel, the money we spend in a destination doesn’t really benefit the people that live there. While hotels, tours, and restaurants may provide some local jobs, if they are owned by outside companies, a lot of the profits leak out of that destination. 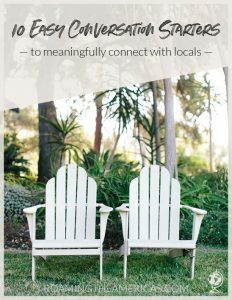 Community-based tourism is when the local community itself leads the way in creating the travel experience (like a tour or homestay), and they also directly benefit from it. 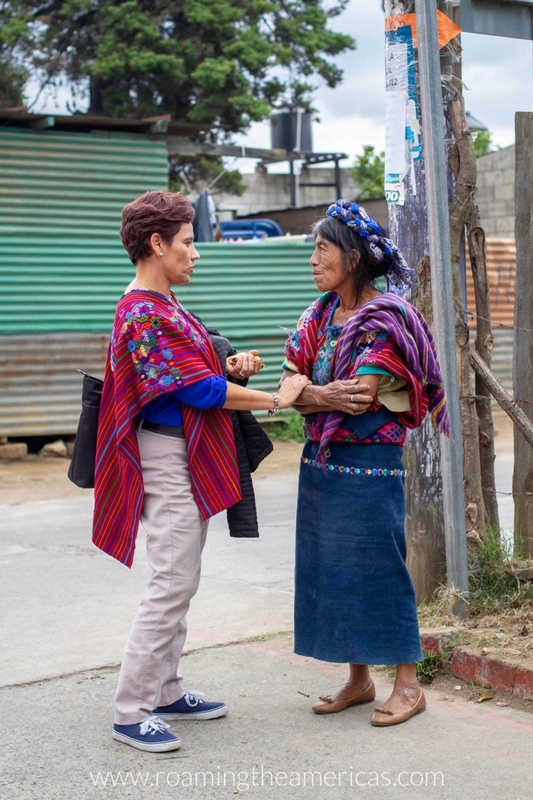 Our trip was focused on community tourism in Guatemala, and while there we also attended a community-based tourism conference (keep reading for more on the beautiful town it was hosted in). Here are 7 of my top picks for unique things to do in Guatemala that benefit the local community. 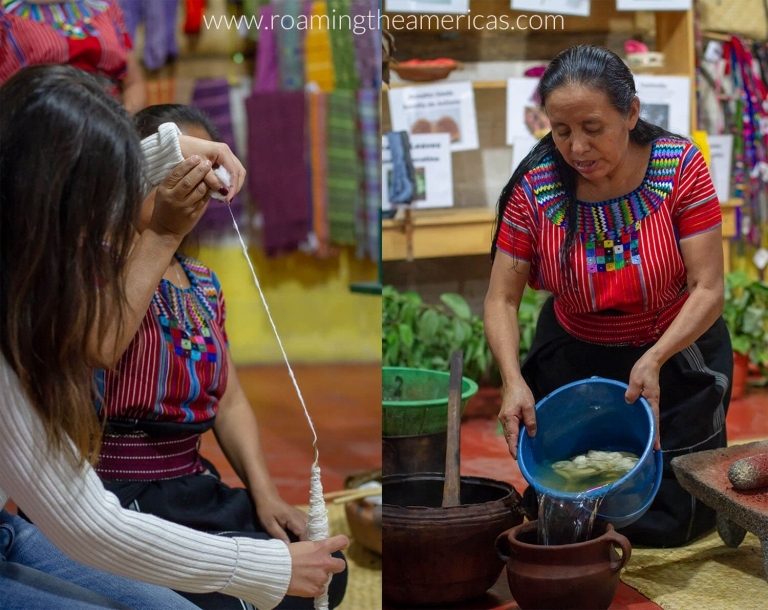 This trip was coordinated by Impact Travel Alliance and Travolution, and I was hosted by Visit Guatemala (INGUAT). All opinions are my own. 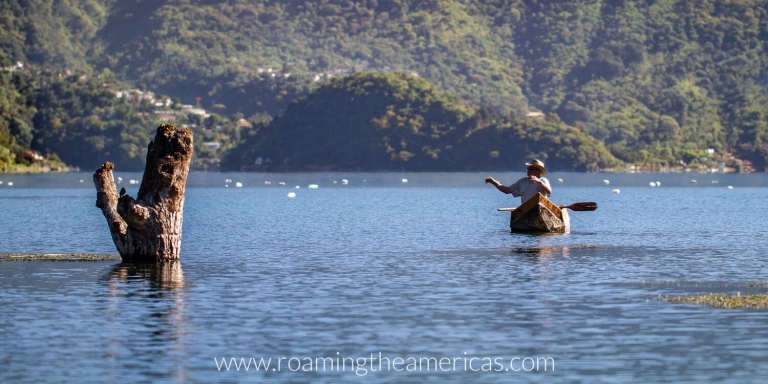 The community of San Juan La Laguna, located on the shores of Lake Atitlan, has been welcoming tourists for more than 10 years. Their homestay program through the Rupalaj K’istalin Association gives travelers a chance for cultural immersion and locals an opportunity to augment their income. 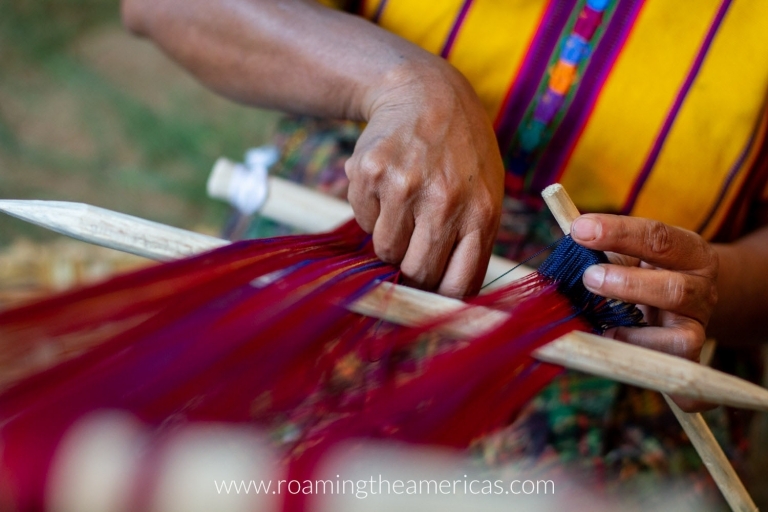 In addition to staying with a local T’Zutujil (pronounced “soo-too-HEEL”) family, you can shop directly from artisans here in San Juan–from hand-spun, naturally dyed fibers at a weaving cooperative to medicinal plants at a women’s cooperative to stunning paintings at artists cooperatives. At Galeria De Arte Gil Yojcóm, stop and admire the stunning technique called “Vista de Pájaros,” which means “birds-eye view.” The artist who founded this gallery developed the style from his memories of climbing trees as a kid. 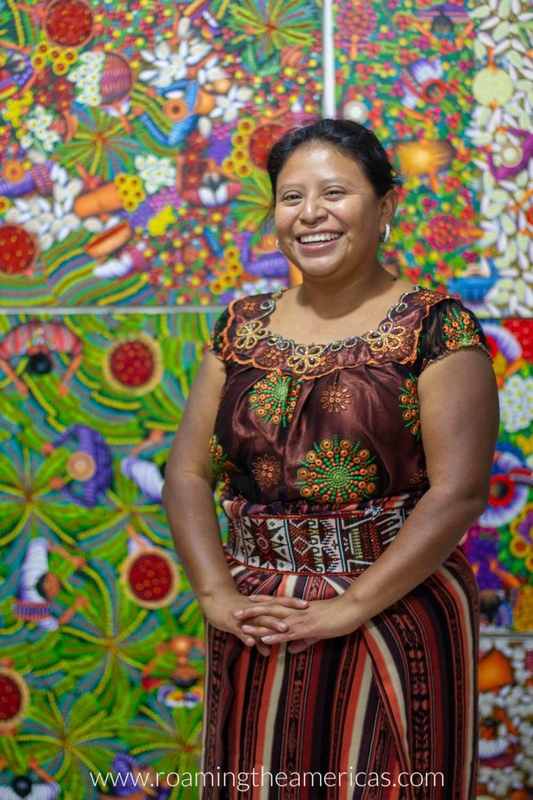 One of the artists in the cooperative, Gloria, standing in front of some of her birds-eye view paintings. 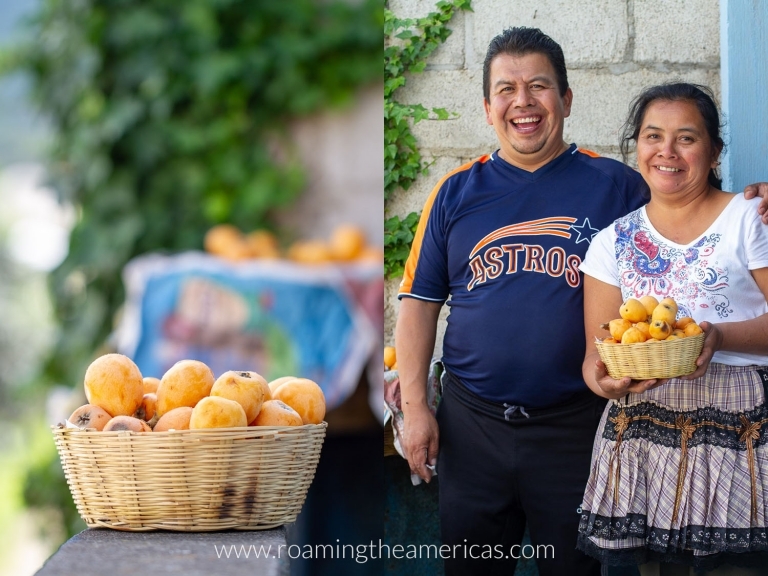 One of the main tenets of community-based tourism is that the local community reaps economic benefits, but this isn’t always straightforward or an easy process. In the community of El Paredón, the non-profit organization La Choza Chula is working to ensure the community benefits from growing surfing tourism while also promoting conservation. They offer free English classes in the community and train local guides to run tours and classes. 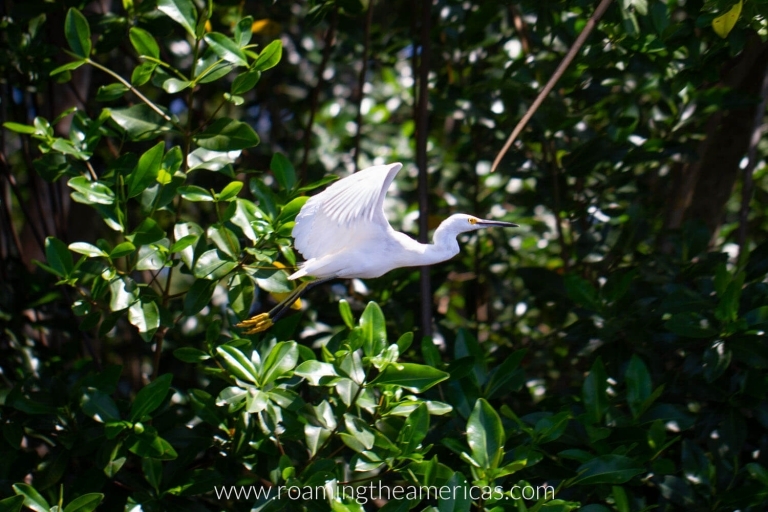 They also work in conjunction with the National Council for Protected Areas (CONAP) in Guatemala to preserve the vital mangrove ecosystem through education, reforestation projects, cleanups, and community tourism. Head to El Paredón on the Pacific Coast to learn how to make authentic Guatemalan food with a local family, paddle through a mangrove as you spot wildlife, or take a turtle tour on the river. This is one of the only areas in the world where sea turtles are present year round, and it’s vital to observe the turtles responsibly and prevent overtourism by traveling with a responsible tour operator like La Choza Chula. 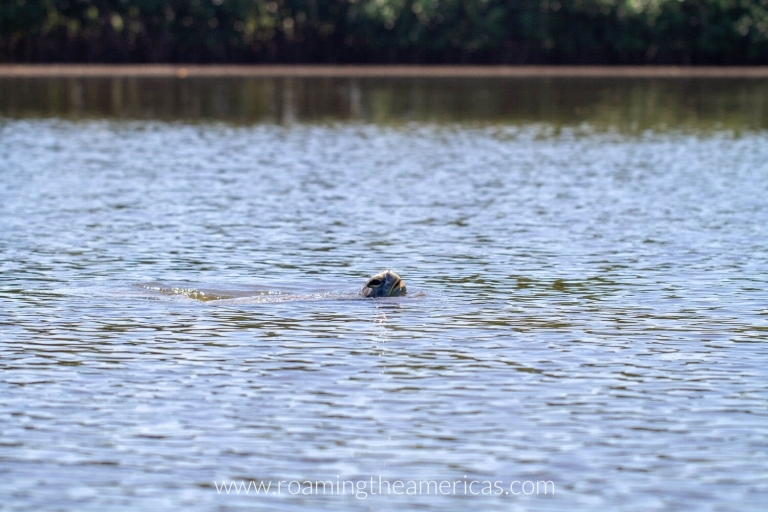 Mangrove and turtle tours with La Choza Chula–you’ll see lots of other boats and people fishing along the way! It’s practically impossible to catch a photo of the sea turtles coming up for air, but you’ll get a good laugh trying. The views from Antigua, which is situated in a valley between three volcanoes, are pretty awesome. When the volcanoes aren’t obscured by clouds, you’ll likely catch some of the 20-30 eruptions from Fuego throughout the day. But if you want really stunning views, head up the hill to San Cristóbal El Alto to explore. Here you can take a tour of the town with their community organization Senderos del Alto, eat at an organic restaurant, or check out the market on Sundays. 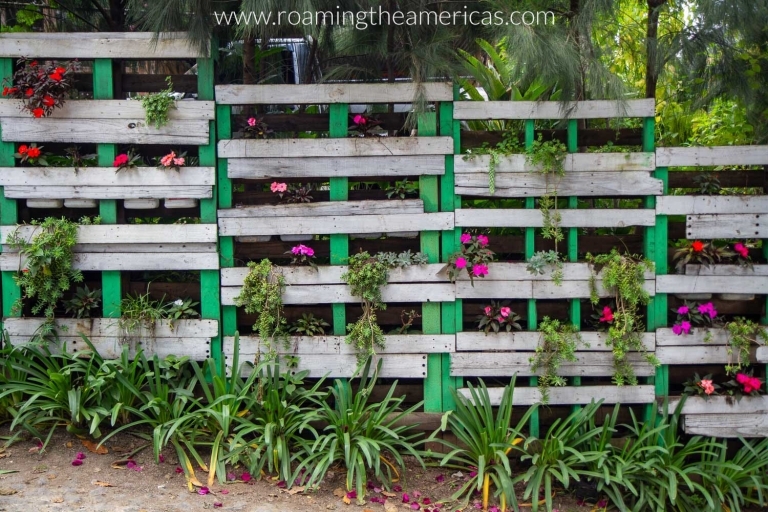 Make sure you leave time to stroll around the beautiful flower-lined streets (earning it the nickname “garden town”)–you might even have some serendipitous encounters like I did! I recently spent four days in San Cristóbal El Alto for the Central American Community Tourism Conference, hosted by Travolution. 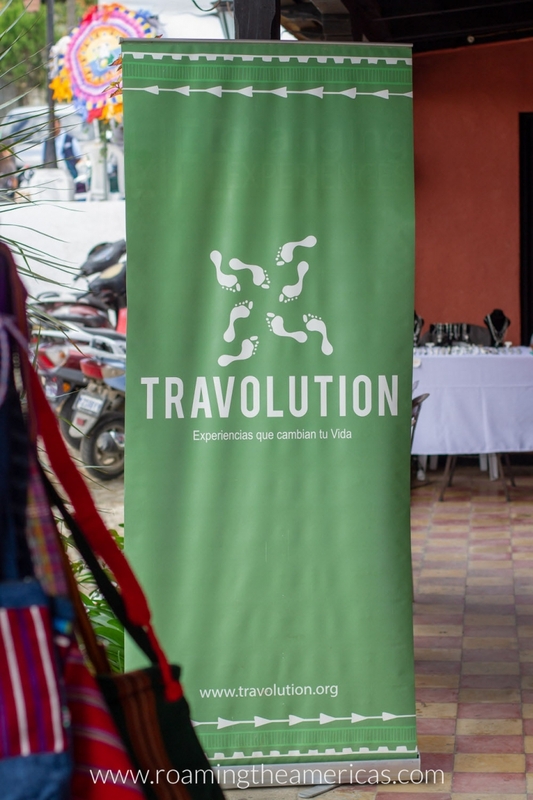 Because Travolution promotes community tourism, the organization has intentionally held its conferences in small communities instead of large cities. Being in San Cristóbal El Alto allowed me to see community-based tourism and grassroots movements in action. As the conference kicked off, one of the leaders in the town shared the story of how development and tourism projects have shaped how community members view themselves. He told us that the nickname for people from San Cristóbal is a “coyote.” In the past, townspeople hated this nickname–feeling that it represented ignorance–and felt ashamed of where they were from. As the community began to develop tourism, and cooperative members were brainstorming ideas for a logo, they started to consider the positive characteristics of a coyote. It’s strong, intelligent, and works as a team. As they looked at it from another viewpoint, they began to develop a sense of pride. Now, the coyote is a mascot that they wear proudly, and they stand strong and hopeful, just as a coyote stands tall under the moon. 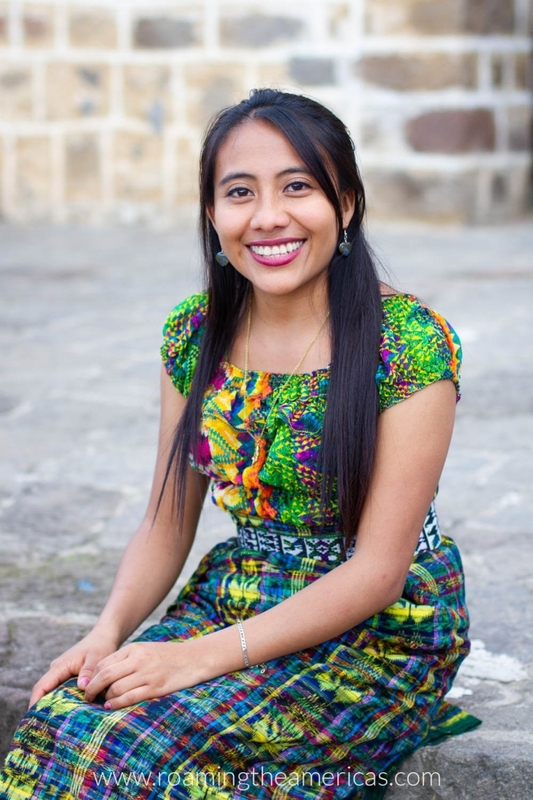 In Guatemala, there are 21 distinct Mayan languages and more than 250 towns, each with their own unique design for their woven garments, called the huipil (pronounced “we-PEEL”). Theoretically, you could tell what town someone was from based on what they are wearing–if you’ve got an amazing memory. 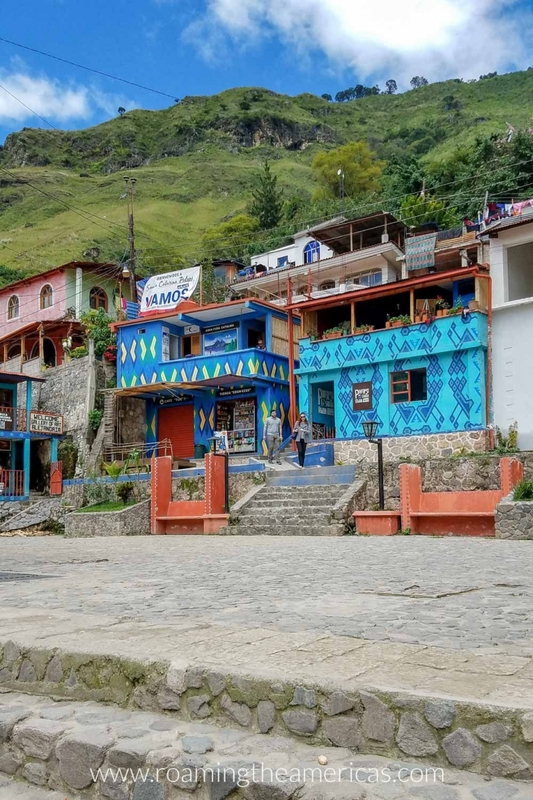 In the town of Santa Catarina Palopó on the shores of Lake Atitlan, an innovative community project has emerged in the last few years: painting these geometric patterns on houses and buildings throughout town. The goal is to preserve their weaving designs, promote tourism in order to increase job opportunities, and to use art as a tool for social renewal. They have already painted more than 200 houses, and the goal is to paint all 850 houses by 2019. 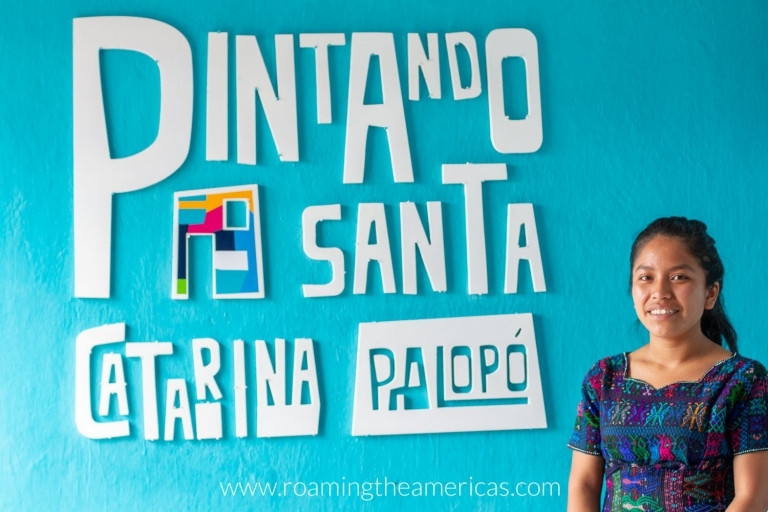 If you’re visiting Lake Atitlan, a stop in Santa Catarina Palopó is a must! 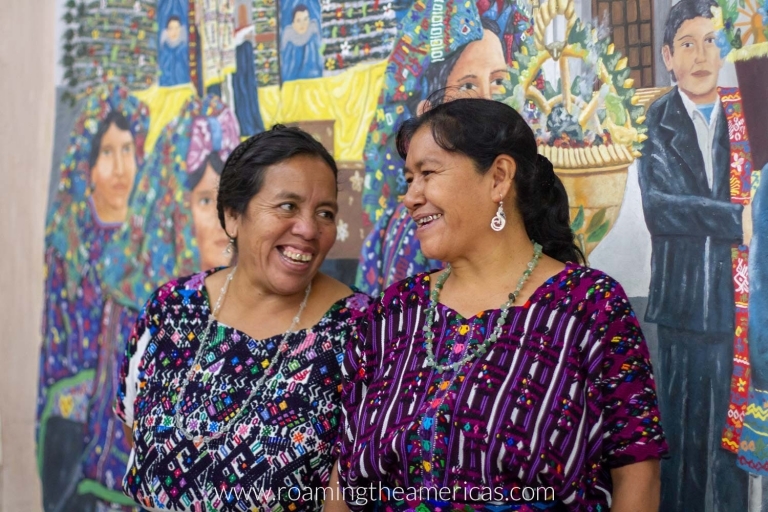 The community of Santo Domingo Xenacoj (pronounced “sheh-na-CO”) is full of people excited to welcome visitors and women who are working to preserve their weaving heritage and protect it from cultural appropriation. 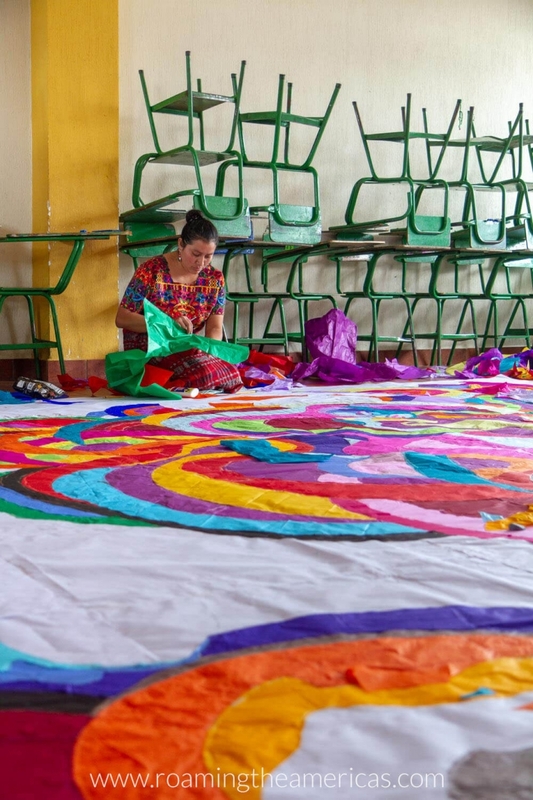 In late October, the people of the town are preparing massive kites for All Saints Day on November 1st. And on that day, you can head to Xenacoj to watch the local festivities. Some of the kites are for display only, but many of them are flown on November 1st. Some take dozens of people to get into the sky! 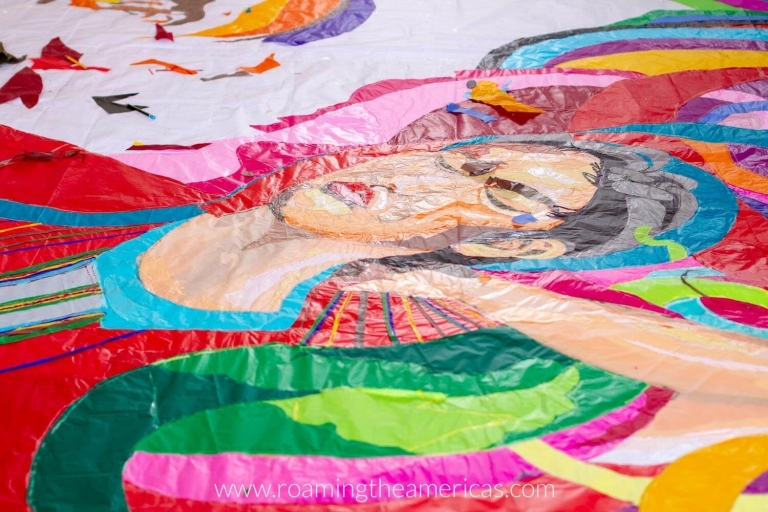 They’re all handmade from tissue paper and are stunning works of art. 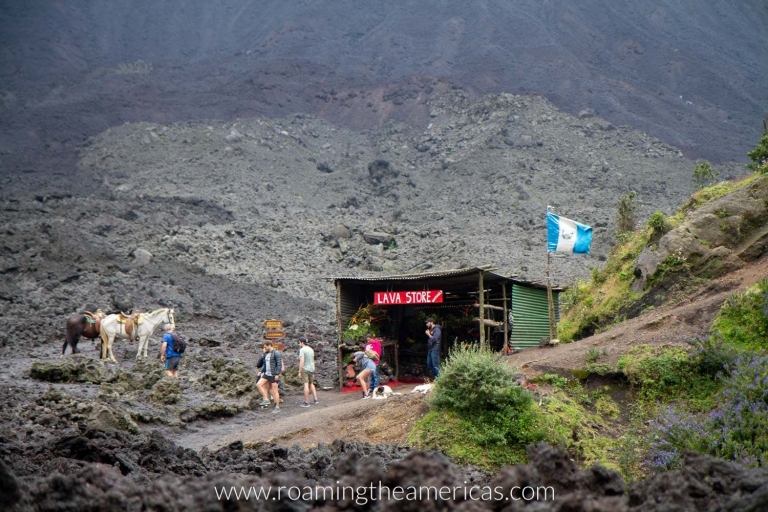 At first sight of the bright red sign that reads “Lava Store,” nestled into a crater of black volcanic rock, you might be tempted to roll your eyes at how commercialization manages to seep into every place that tourists find themselves. “Any chance to sell stuff” was the reaction I got from one friend when I described where I had purchased a bracelet. But the Lava Store isn’t what you’re thinking. In 2010, the Pacaya Volcano had a serious eruption, spewing rock on nearby villages and covering Guatemala City (about 18 miles away) with ash. Thankfully, most people evacuated safely, but hundreds of homes were damaged. Out of the recovery and rebuilding efforts, the Lava Store was born as a way for people to earn an income from travelers who came to hike the volcano. Each piece of jewelry, made by a local artisan, has some volcanic sand in it–symbolizing that something beautiful can come out of destruction. 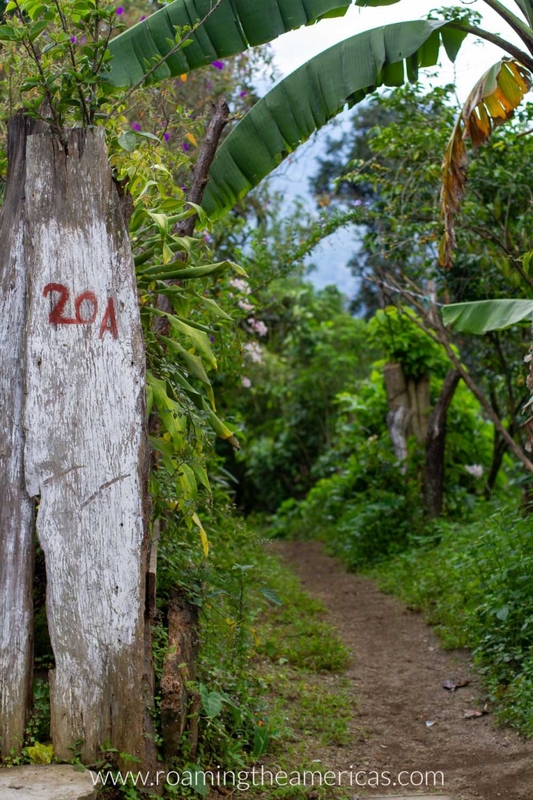 Not only does purchasing from the Lava Store benefit the area, hiking the volcano with a local guide provides good employment opportunities for those who call Pacaya home. 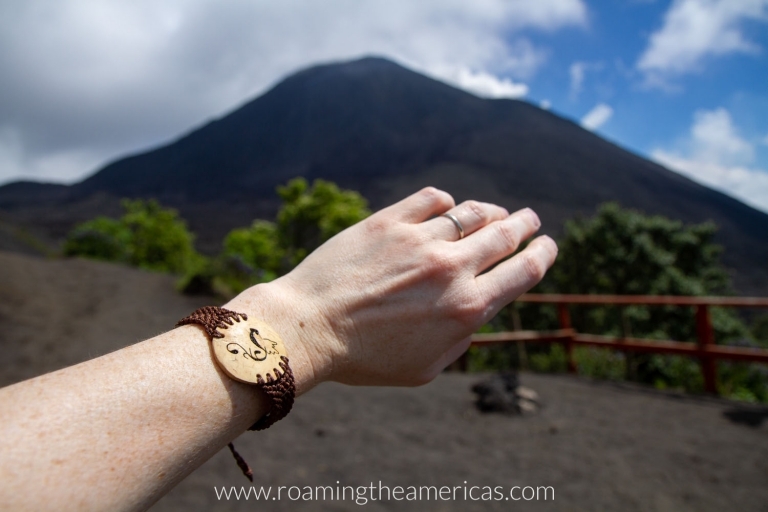 I’ve never seen the Quetzal, Guatemala’s national bird, in the wild…so for now this bracelet from the Lava Store will have to suffice! Can you see the shape of the bird? Our guide, Rodolfo, has lived here his whole life and chose to stay even after the 2010 eruption because he loves his home. He’s been guiding hikers for more than 20 years! De La Gente is a direct trade coffee company that works with local cooperatives by providing capacity building programs and bringing their product to market. In recent years they have begun offering community-based tourism experiences in their community of San Miguel Escobar. They began this in order to open up economic opportunities to women in their community since most of the coffee farming is done by men. Just 10 minutes from Antigua, you can head here to make your own peanut butter with Lidia and her sister Lilian. The workshop takes about 1.5 hours, and you’ll do the process from start to finish and leave with your own small jar of peanut butter. Thanks to De La Gente for hosting a few of us who were attending ECATC 2018 on a makeshift “tour” of several of their workshops! Travolution is an organization that promotes sustainable development through community-based tourism initiatives. They have four main areas: local community development (capacity building), providing networking opportunities (important for community tourism where most people are in rural areas), research development, and operating tours. They currently offer tours in South America (especially Chile) and plan to begin operating in Guatemala in the future. Find out more about Travolution’s tours here. Impact Travel Alliance is a community of changemakers who are committed to improving our world through tourism. They have three main initiatives: global conferences, local chapters, and the media network (which I’m part of). Visit Guatemala is the country’s tourism board, and they have tons of trip planning resources on their site. 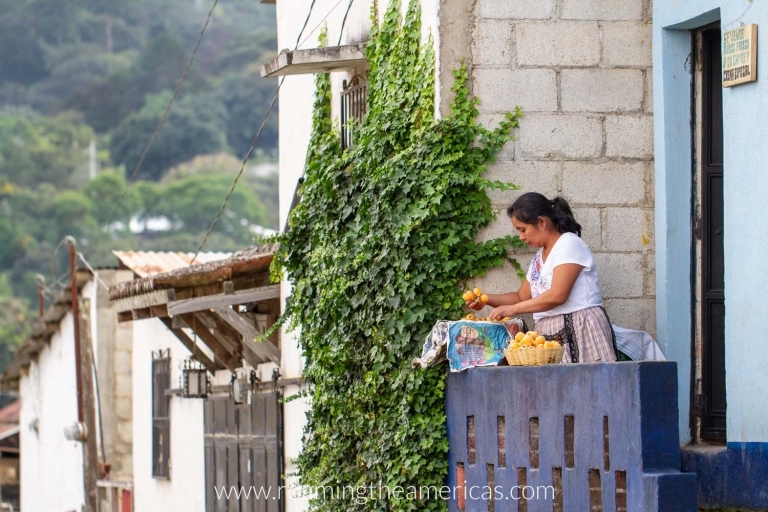 Head there for Guatemala travel ideas! Which of these would you most like to experience? If you’ve been to Guatemala, what was the highlight of your trip? Let me know in the comments below!